Tobias Hanraths shouldn’t have come here. They had a good life. You only learn about it later on, but before they all became infected by an aggressive parasite, the inhabitants of the nameless village, situated somewhere in the Spanish countryside, lived reasonably happily. They mostly grew crops and raised animals, but there was some special stuff too. Weddings, childbirths, other festivities— simple pleasures, but pleasures nonetheless. There might have been some quarrels over fences or tools, but nothing major. 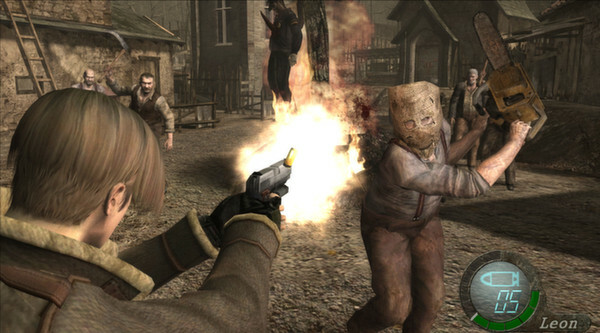 But when you arrive as Leon S. Kennedy, the main character of Resident Evil 4, nothing’s left of the town. The policemen who drive Leon to the village aren’t particularly friendly, but that’s nothing compared to the reception that awaits him once he gets out of the car. The road ends at the edge of a dense forest, but the dead trees and the afternoon twilight make it seem like it is shrouded in a kind of supernatural fog. And the nearby brook doesn’t sound like water; it murmurs like some sleeping monster. Things get worse when you take a few steps down the narrow path between the trees. There’s no one around, just some crumbling tools and furniture silently rotting in the heat, but you still can’t help but feel like you’re being watched. You don’t have to be a trained killer on a search for the kidnapped President’s daughter to know the feeling. It’s the same feeling every traveler who’s ever stepped out of a bus in the wrong part of town in a faraway country knows: you might be there with the best of intentions, but you still feel like your very presence is an insulting disturbance. It’s hard to put a finger on the exact reason for this. It might those curtains moving right outside your field of view, or the sounds of sawing and hammering that stop as you turn a corner. It could be the empty streets that feel like they were crowded just a few moments before, like everyone dashed out of sight, or the sunlight that burns your eyes, even through clouds and sunglasses. It makes you hasten your walk, trying to project confidence and purpose, all the while checking every corner and shadow twice. Of course, this is usually where the difference between games and real life works out in your favor: as a traveler, you’re probably not going to get mugged just because you read a bus schedule wrong. But Leon S. Kennedy’s paranoia is more than justified, because there is someone behind the curtain, watching his every move. Actually, it’s more than just one. And as soon as Leon steps through the first door, they stop staring and start throwing axes. It’s the start of a weird, drawn-out battle that moves from isolated huts at the outskirts of the village to its center. All around you are grisly signs that this is the very wrong part of town indeed: blood on the walls and floors, the humming of insects gathering around dead bodies, a woman stuck to a wall with a rake through her head. There are traps in the forests— not for animals, but for people. People like you. The primal fear of being a stranger in a strange land becomes a reality as Leon turns from a hunter of kidnappers into a hunted man himself, each stumbling step leading him deeper into danger. Mysteries abound, highlighting the intrusion of his presence. There is a bonfire in the village where bodies are being burned; were these people dead before they were tied to the stake? There is a graveyard and a church that still seems to be used, but what are they praying to, and for what? And then there’s the lake and the thing that lives below its surface. The tragedy is that there are remnants of the old, simple life right amid all the strangeness and horror. There are blankets on the bed and food on the table. Chickens peck around their coops, oblivious to the chaos around them. And there’s the speech of the village inhabitants itself – not the meaningless moaning of zombies, but actual words. They communicate with each other; they even seem to have some kind of hierarchy. ”A foreigner!” they yell whenever they spot you, reminding you that you’re on the one who chose to come here and disrupt their strange way of life. It’s what makes you feel guilty, even while you’re slaughtering dozens and dozens of them. Sure, they are literally coming at you with torches and pitchforks, but it still feels like this might be partly your fault. Maybe you insulted them in some way? Maybe they’re scared of you? Maybe this is all just a giant misunderstanding? Are they right to be angry with you? Are you the monster? That question gets answered later on: no, you are not. 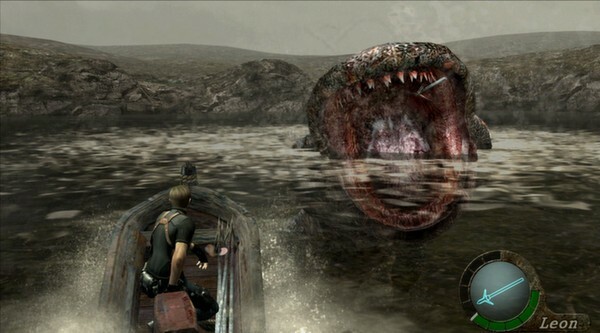 As you move deeper into the world of Resident Evil 4, into medieval castles and fortress islands to meet the ghastly creatures hidden there, it becomes abundantly clear this is no misunderstanding – they are not even a little bit human anymore, and they very much mean to kill you. This realization is something of a relief, but it’s also a loss. Fighting murderous monks, mutated dogs, or invisible insects might be justifiable, or even exciting. 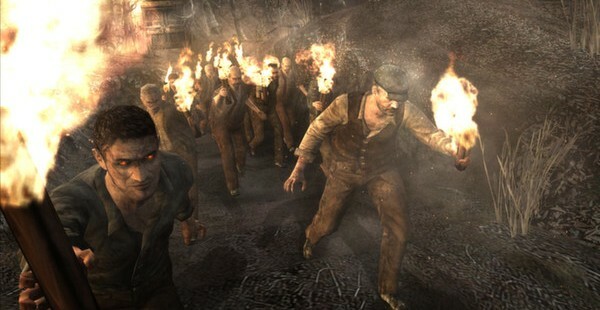 But there’s a different, more complicated kind of terror when fighting the villagers in the remnants of their good life.